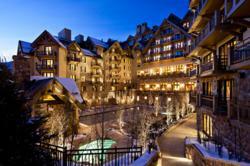 Four Seasons Resort and Residences Vail is celebrating its 1st anniversary this winter. Situated at the base of one of North America’s most acclaimed ski resorts, Four Seasons Resort and Residences Vail is celebrating its 1st anniversary this winter – the property opened one year ago in December. Four Seasons Resort and Residences Vail has already received numerous accolades in 2011, including the coveted award for “Best Development Colorado, Highly Commended” by the America’s Property Awards and Four Stars awarded to Four Seasons Resort Vail from Forbes Travel Guide. Additionally, The Spa at Four Seasons Resort Vail received Five Stars from Forbes Travel Guide. Four Seasons Resort and Residences Vail marks its first year being open with positive progress and an optimistic outlook. Growth in resort occupancy has increased over the past several months and Four Seasons is currently one of the leading resorts amongst its Vail competitors. In turn, with more people visiting the resort and experiencing the destination, sales opportunities for Four Seasons Residences Vail look increasingly promising. Residence specialists to prepare pre-arrival residence accoutrements and activities such as family dinners, private guided mountain outings, grocery stocking for special meal plans and arranging an in-residence massage. Four Seasons Residence Club Vail includes 19 fractional residences sold in 1/12 deeded interests with annual usage throughout all seasons. Homeowners can choose from two-, three- and four-bedroom condominiums ranging in size from approximately 1,842 to 3,564 sq. ft.
Four Seasons Private Residences Vail offers 16 whole-ownership private residences including one-, two-, three-, four- and five-bedroom condominiums that range in size from approximately 1,600 to 5,750 sq. ft.
For more information on Four Seasons Private Residences and Residence Club Vail, please visit http://www.vailresidences.com or call 1 (877) 748-VAIL (8245). Four Seasons Hotels and Resorts has been a pioneer in branded residences since 1982. Today, with the movement to branded residences firmly established and gaining momentum yearly, Four Seasons remains an innovative leader, providing a portfolio of whole and fractional residences in the most desirable locations throughout the world. Four Seasons residences comprise two types of offerings: Four Seasons Private Residences, ranging from private homes adjacent to resorts to penthouse condominiums atop urban hotels, and Four Seasons Residence Clubs, a fractional ownership option featuring fully-appointed vacation villas as a worry-free alternative to year round vacation home ownership. All Four Seasons residential offerings provide owners with access to Four Seasons services and amenities which may include golf, spa, in-room dining, housekeeping, concierge service – everything that makes a Four Seasons experience so rewarding. Vail Development 09 LLC is an affiliate of Barclays Capital formed to own and develop Four Seasons Resort Vail.